Ruger 10/22 Charger Takedown Package! 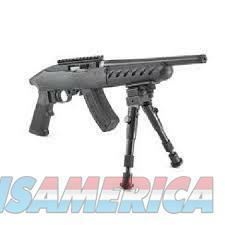 Description: New In Box Ruger Charger Takedown .22 Long Rifle Semi-Auto Pistol. -Features a standard A2-style grip and can be easily changed for any MSR grip. -Factory installed Picatinny rail provides ample room for scopes and red-dot sights. -Includes a BX-15® magazine, with 15-round capacity, perfect length when shooting with the included bipod prone or from the bench. 10-Round models also available. -Included adjustable bipod offers rock-steady sighting.Threaded barrel features a 1/2"-28 thread pattern and a factory-installed thread protector. -Includes Ruger carrying bag for storing the firearm and accessories.